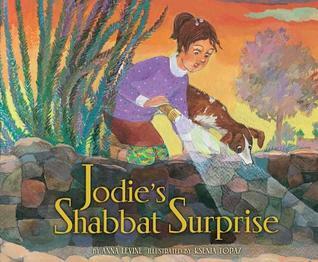 I absolutely loved this book, which is much needed, as resources for Jewish children can be difficult to find. The story is engaging and teaches about how wine was made and archaeology. There is also additional information about the true story upon which the book was based, allowing parents an additional talking point with their children. The illustrations are absolutely gorgeous and engaging for little eyes. There is just the right amount of detail, allowing plenty to look at without being too busy or distracting. A wonder book I highly recommend to those who practice Judaism or those who wish to teach their children about it and the Old Testament. This review is based upon a copy acquired through the Goodreads First Reads program. When her dog Digger disappears, Jodie eventually finds Digger but also discovers an old wine press. After learning more about it from her father and his archaeologist friend, Jodie enlists the help of family and friends for a birthday surprise for her father. They remove the debris covering the press, clean it up, and they mash grapes for their own private wine party in celebration of their ancestors' traditions. The story is interesting as are Jodie's own actions and dogged pursuit of information about the wine press, but I just couldn't stop wondering just how many grapes would be needed to fill a bottle of wine. Full review in LMC Magazine. Anna Levine - FREEFALL (Greenwillow/HarperCollins) won the Sydney Taylor Honor’s Award the same year that JODIE’S HANUKKAH DIG won a Sydney Taylor Notable Award. Jodie has gone on to discover many new archaeological sites in Israel. Spring 2015 is the third in the series where Jodie goes to a park near Jerusalem, loses her dog Digger, discovers a wine press from the First Temple period and succeeds in rescuing her dog. RUNNING ON EGGS (Front Street/Cricket was on the NY Public Library’s best book list in the year 2000), I have also published short stories and poems in magazines and won the SCBWI Magazine Merit Award for both short stories and poetry. Most recently two poems were published in YARN (The Young Adult Review Network). I'm presently working on an adult novel, SURROGATE SISTERS, which is set in Montreal, Quebec. Will keep you posted!